New old guitar day time. I've been looking for an older big headstock Strat for a bit and until now all the ones i've found were overpriced and had the bad toffee apple finish on the maple where it starts to shear off in huge chunks. I managed to find one of those 1979 25th anniversary models. I'm not too keen on the Anniversary decal on the front but hey-ho, it plays great.and these have the 4 bolt neck and truss at the heel rather than the bullet style in the Strats of that era and the neck is a nice average size, bot the baseball bat type most late 70s maple necks seem to be.. It also doesn't weigh the same as a small moon so that's a bonus. Previous owner installed a SD SC sized JB Jnr with coil split tho he has included the original pot and pickup in the case (also original) so I can put it back to stock. Apparently this version was the precursor to the new Am standard in '88 or so the internet says. Anyhoo I'm going to set it up for 10s tonight and decide whether or not to return it to stock. It's a non original trem bar and it's missing the bridge cover but that's no biggie. The best news is that I traded a couple of things for it that I got through a few deal upgrades so the actual cost to me was super low. Essentially I had bought a Squier JM for �100 that I traded for that 60's tribute SG and I had that Baja tele I paid �200 for that I ended up swapping for my 70's Tribute LP. The previous owners of the LP and SG had got them in that Thomann blow out when they were sub �300 each. So I ended up giving the guy the SG and the LP for the Strat. It ended costing only �300 in hard cash and a little bit of time so I'm very chuffed. It's cool as mince. I also really like the anniversary decal. It's kinda kitsch. i like the decal.. looks killer man nice!! Love these. It's very common to see the silver finish a totally different colour [usually green] or just rather worse for wear, so you got a pretty nice one from the looks of it. This is a photo I took of my Mentor, the late great legendary Ivor Arbiter. If my memory serves me right, this was at the time that Fender launched a special Anniversary Stratocaster. 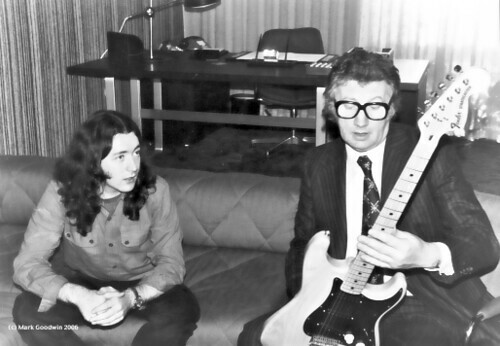 Rory Gallagher, who was a dedicated strat player joined us in the Soho Square office of CBS/Arbiter Ltd to discuss the instrument and guitars in general. Rory was a wonderful warm and gentle Irishman, and although I never got to know him that well the short times that I spent with him and his brother Donal were quality times. I always thought the decal was dumb too but a guy in a local band plays one and seeing it in action it was kinda cool in a kitschy way like gusman said...like these things are so old now the only people who would understand why it has the word Anniversary on it are other guitarists who know what it is. He did hint it was a lighter one, Fender's body weight was all over the place in the '70s. Some '70s Strats make my immediately-pre-chambering LP Standard blush, it's hard to believe when you pick them up (especially when the necks are so small and comfy, a weird mix to me for some reason). Ta for the extra info. This one has a few greener spots around the neck etc where the sun has hit it over time. It looks a tad greener in some lights but that's OK with me. It's not lightweight by any means but still way lighter than I expected. Marginally heavier than my Japanese 62 ri but not in LP territory. I have tried a few 70s Strats that were incredibly heavy, and the necks were too big. Not in the beefy kinda way that's comfy like some Gibson necks but just a bit big all over and plain uncomfortable/unfinished feeling. They reminded me of the initial run Fender Mexican standard necks. Cheap feeling. These also had the large/low frets that Gibson favoured around these times and they play very well. I would wholeheartedly recommend one of these to anyone tempted by a vintage Strat that's not going to break the bank. From the reviews I've read on them they seem to be right up there in terms of QC. Big headstocks are so badass. Now you just gotta get rid of that bucker and scallop the fretboard! What does rubbing shellfish on the fretboard do? Helps build up your playing mussels.